This is a big week for Apple; it has two new phones hitting store shelves, and a brand new operating system that becomes available Sept. 18 for compatible devices. The new mobile operating system is a big visual change, and is likely to feel somewhat disorienting to users upgrading from iOS 6, but in most important ways, it’s not that dissimilar from what you’re used to, and many of the changes are definitely for the best. If you’re coming brand new to iOS 7 and have been ignoring the Internet for the past three months, you’re going to be in for a visual shock. Apple has completely overhauled the look of iOS with version 7, starting from the lock screen and extending to the icons of default apps, system fonts, status bar indicators, system elements like Notification Center and more. There are new sounds, too, including ringtones and notification cues, in case a host of new info for your eyeballs to process wasn’t enough. 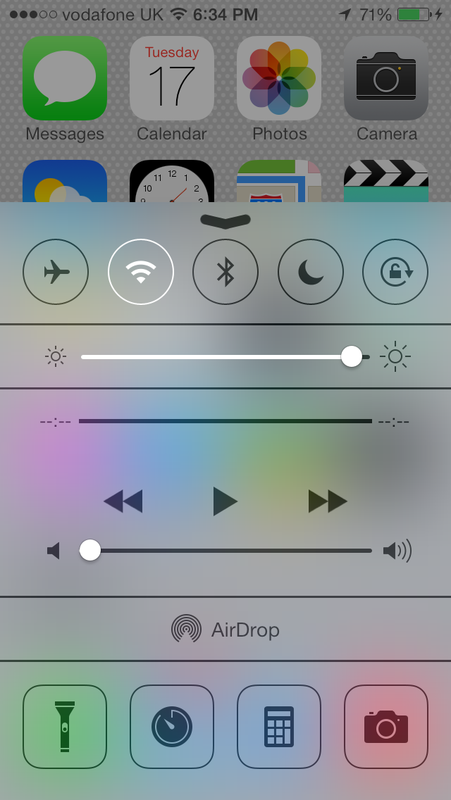 This is a brand new feature for iOS 7, and one that’s incredibly useful. The Control Center provides quick access to commonly-used settings toggles including Wi-Fi, Bluetooth, Rotation Lock and Do Not Disturb mode, as well as to the media player controls, AirDrop and AirPlay, and some key apps including Calculator, Timer and Camera. There’s also a flashlight, which may sink a thousand small app developer ships, but which is a huge convenience for users. Apple’s AirDrop feature made its debut on the Mac, as a feature addition to OS X. Now the simple sharing service makes its mobile debut, allowing them to share files with anyone on the same network with a single tap. The recipient then approves the request, and the file is added to their own iPhone. It’s a very easy method for sharing pictures from one device to a family member’s or friend’s, and requires fewer steps than sending an email. 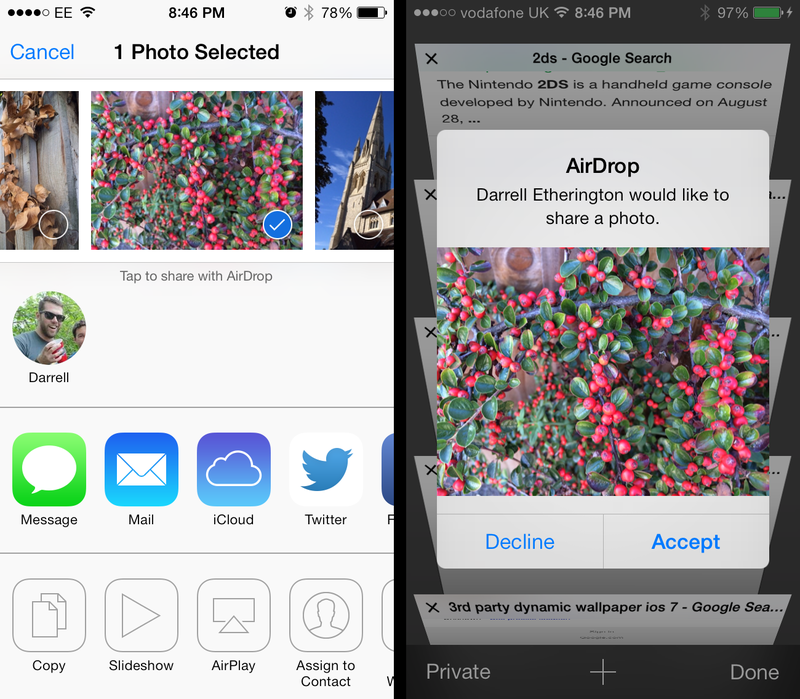 You can make AirDrop available to anyone on your current network, or lock it down to just your Contacts. This feature is great, but leaves me wishing Apple had set it up to work between iOS and Mac, which isn’t yet possible. 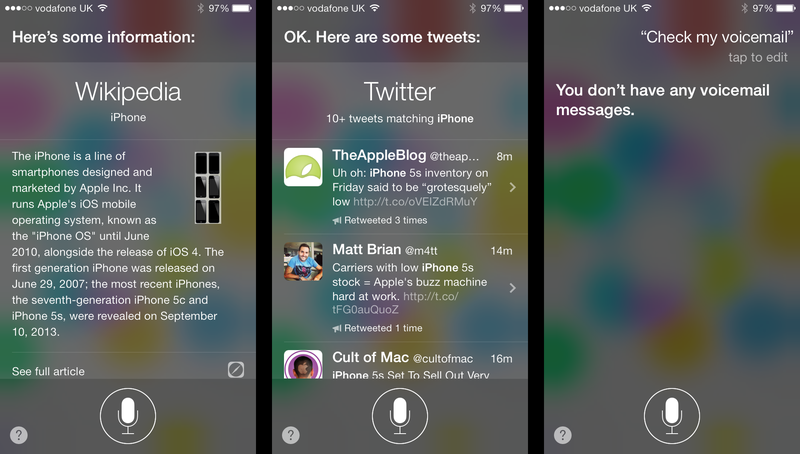 Aside from a visual update, like the one everything in iOS 7 is getting, Siri adds new voices designed to make it seem more human, and additional data sources including Bing, Wikipedia and Twitter. It can now return phone calls, playback voicemail and generally do more that you’d like a hands-free assistant to be able to do, perhaps while driving, for instance. The additions to Siri have prompted Apple to remove its beta tag, and indeed it does seem more generally useful, and pushes you out to exterior sources far less frequently, which is good because it leads to far less of a “let me Google that for you” effect. I’m not sure Siri is quite the virtual assistant I want it to be just yet, but it’s getting there. 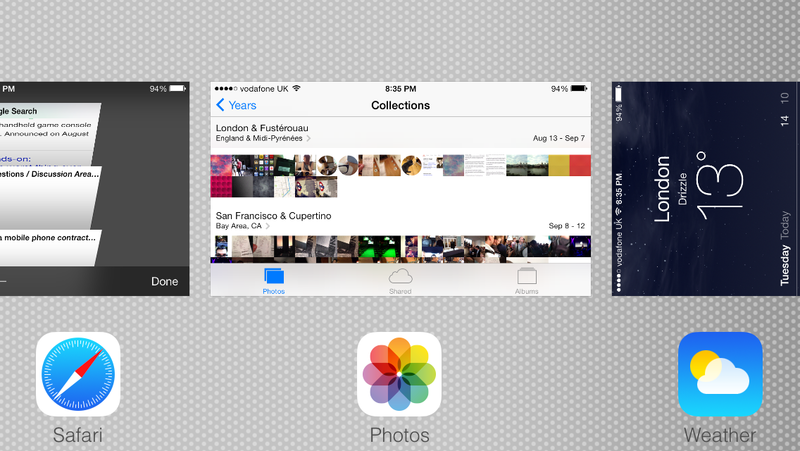 Apple’s multitasking hasn’t been great in the past, acting basically as a quick app switcher. In iOS 7, the multitasking gets smarter, learning your habits and updating content in the background depending on when you regularly use your apps, and when you’re connected to power and Wi-Fi, so as to avoid data and energy burn. The new app switcher design is also much better, showing you a preview of the app in the state it was in at close, rather than just a completely static app icon that tells you nothing at all. Swipe up to close open apps from this screen. These features may be familiar to webOS users, but they’re smart, no matter where they came from. 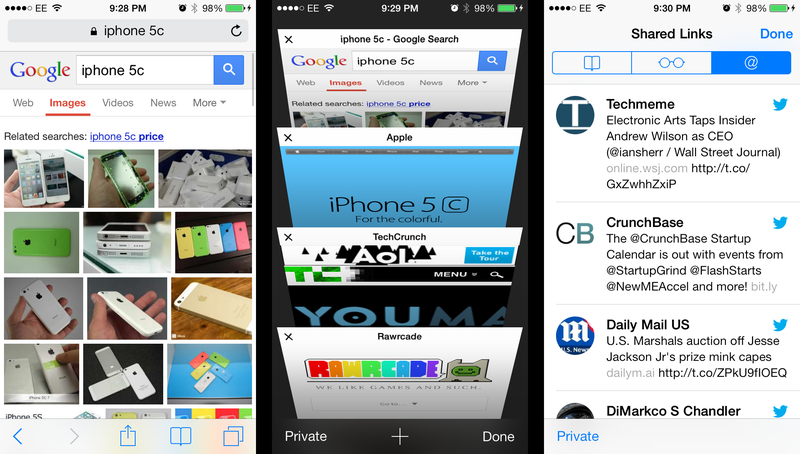 Apple’s mobile web browser gets an overhaul with iOS 7, one which lets the chrome melt into the background. When you’re on a page, the address bar and bottom navigation bar fade away, giving you a full-screen experience. The address bar is also finally a unified search bar, too, which is cause enough to break out the piñata and celebrate. Apple has also put a private browser right in the main app, meaning you won’t have to go to Settings every time you want to get incognito, and there’s a new tab browser that lets you page through and view multiple open tabs at once much more easily. Shared links uses the built-in iOS Twitter integration to gather a reading list from the people you follow on that social network, which is a nice built-in content discovery twist. Apple’s iOS camera software is brand new in 7, with an interface that brings all modes out into the open instead of hiding features behind buttons. Even though everything’s now a scroll away at most, the interface is very different from the one it replaces, and this could cause some hiccups for new users. 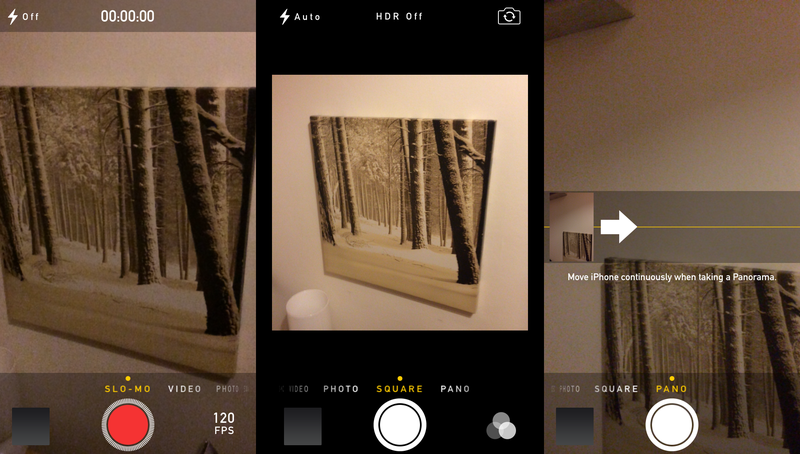 The key component to be aware of is the new slider for different camera functions – video at the far left, and panorama at the far right. It may not be immediately apparent that this list of modes is itself scrollable, as there’s no obvious arrows or control buttons. Other changes here are the presence of live filters, which you can apply before filming, and the ability to take burst shots and slow motion video on the iPhone 5s. All phones capable of installing iOS 7 get a variant of burst mode, in fact, which takes pictures in rapid succession, but not at the 10fps rate of the iPhone 5s, and without the auto selection feature that suggests which shot is best. In the 5s, people will really notice a difference with much faster auto-focus, faster capture and other improvements. Apple’s new photos app applies some basic organizational logic to your picture library, making it easier to find specific moments, and to browse based on locations and date, which is much better than having to organize events yourself. 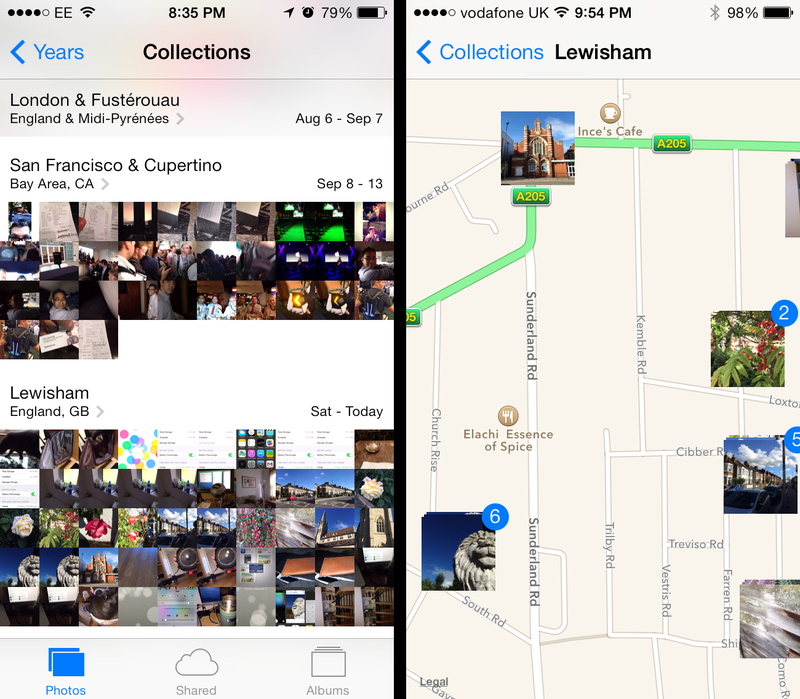 You can zoom out and see your entire history of mobile photos as measured in years, too. Other improvements include the addition of a shared photo album tab, which works with iCloud photo sharing, and photo maps that allow you to browse your picture history on a built-in Apple Map. It’s a lot more interesting than the fairly boring interface it replaces. iTunes is the leading source of digital music content, so Apple introducing iTunes radio, a no-limits streaming service available free via an ad-supported model, or without ads if you’re an iTunes Match subscriber is a big deal. This is a U.S. account-holder only service, so international iOS 7 users will have to wait, probably until licensing agreements are put in place. The recommendations iTunes Radio serves up based on genres and artists I like were very (frighteningly?) accurate, and that makes for a thoroughly enjoyable lean-back listening experience. I’m still an Rdio fan when it comes to streaming music services, and their new personalized radio stations are also impressive, but Apple will provide everything most users need in custom Internet radio with this new feature, which is also available in an upcoming iTunes update on the desktop. 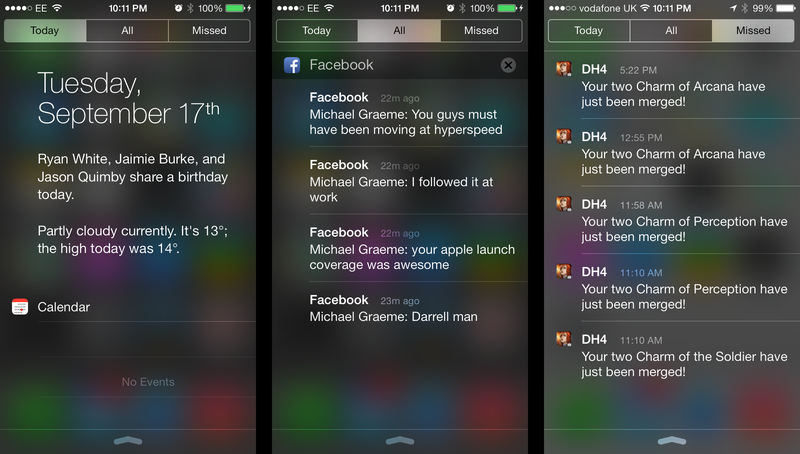 The new Notification Center in iOS 7 is a big change from the previous version. There’s a new “Today” panel that shows you events and birthdays going on for any given day, as well as weather conditions, stocks, and upcoming things to note for the next day, including alarms and calendar events. Swiping brings you to the list of “All” and “Missed” notifications, which shows you things sent by your apps, either in total, or just those that are new since the last time you checked your device. In settings, you can turn off or on each element of the “Today” view, and limit lock screen access to both that and your general notifications list. Today is a part of notification center that has some real potential, especially if Apple broadens its functions and makes it more of a Google Now competitor, but overall the Notification Center update isn’t all that exciting. Notifications themselves still seem mostly not super useful, so perhaps providing more context or similar is the way to go. Apple has provided some small updates to the App Store and to Find My iPhone with iOS 7, including tools that make it easier to protect and recover lost or stolen devices. The App Store has a new “Popular near me” feature, which so far hasn’t been showing all that much beyond transit apps based on my location. It’s another way of making discovery easier on the iPhone’s ever-growing software library, though, and with use it’ll likely get more intelligent. 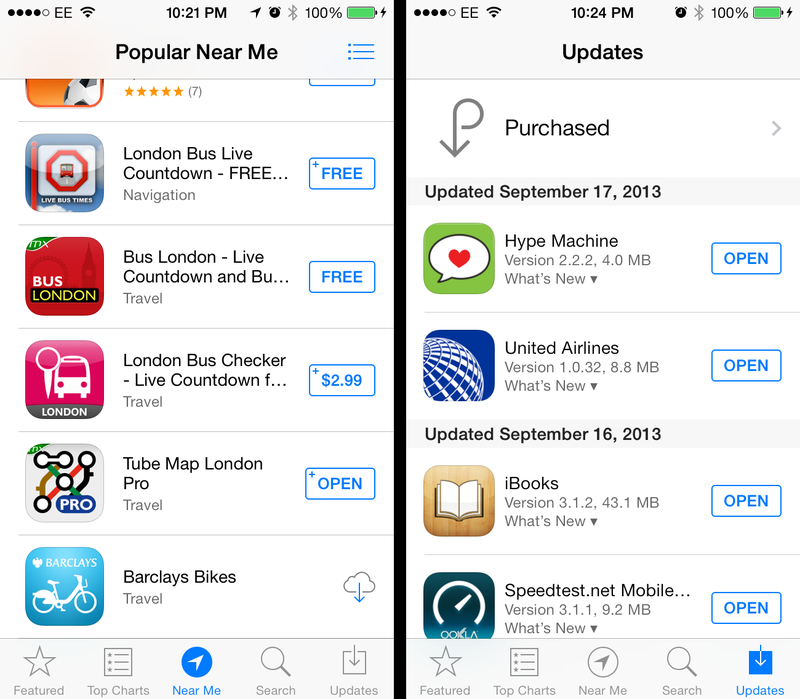 Plus, if you’re a visitor looking for relevant apps in a new spot, transit information apps would be high on the list. Find My iPhone gets new advanced security features, like the inability to wipe or turn off Find My iPhone without an Apple ID or password. It can also display a message on a device that’s been wiped, so you don’t need to choose between trying to recover your lost hardware and protecting your data. Plus, anyone with your phone will have to enter your Apple ID and password to make it usable again. All of these are great features that address the growing savvy of criminals around Find My iPhone and how to circumvent it. There’s a lot more going on in iOS 7, including new sounds, dynamic wallpapers, changes to the design of Calendar, Notes, Reminders and more, but the big shifts that go beyond new design are those listed above. There’s no question that iOS 7 will be a dramatic change from the iOS many users already know and love, but on balance it’s an update packed with plenty of new features that make using Apple’s mobile devices easier and more enjoyable. iOS users with an iPhone 4 or later, iPad 2 or later, iPad mini and iPod touch (5th generation) will be able to download the update, but Apple hasn’t put a specific time on when exactly, so watch this space for updates.